Huge update! While it may not look like as big of a change from when UHS went ‘dark’, the fact that we’ve touched every single page to make it responsive and made our data queries more efficient means that, even behind-the-scenes, this is a huge change. I’m surprised it ONLY took a little over two months to do. I was envisioning it taking a full year like UHS Dark did. I’m probably going to be taking a break from development for a while; it will give you time to get used to things. With the new build we deployed some new tools to help us identify issue behind the scenes. One of those was a bug for the Goalie Pull Timer (the amount of time remaining in the game before potentially pulling the goalie). Since this bug affects the actual database and not just the scripts, we have to take UHS down to deploy the fix. Finally we can use UHS on pretty much any device! For a time I was looking at creating an app, however, there were some technical limitations that were going to be a pretty big deal to handle. So, instead, we went with something we were more familiar with, especially since we just made the public sites responsive. So basically every single page / screen you use in UHS has been redesigned to be “responsive”, which means that it will work on pretty much any device (phone, tablet, pc, etc). We create the page ONCE, not have 3-10 different versions for each device or screen size (that would be a nightmare to design and even maintain). In some cases on a PC, the page will look a little barebones: this is intentional. When designing for responsiveness, you need to design for the smallest screen and then expand outwards to larger screens. There are a few cases were things are going to look a little crammed for small screens but we think we’ve done a pretty good job at getting things condensed. You will notice that some things have been moved around. We did this to try to group similar items together, which in some cases meant completely destroying an old sub-menu. The biggest changes will be to the COM+ menus: many items from the old Settings menu were redistributed to Manage and a new COM Actions menu was created to handle more of the day-to-day items. General Menu options: All users will have access to the UHS, News, League and Statistics menus. You will find your account settings at UHS > My Account. General information will be found under League and seasonal statistics can be found under Statistics. We’ve broken out the Schedule, Career Stats, Record Book options from Stats Central as well as added Awards, Champions, Drafts and Hall of Fame. COM/Owner options: You will find Play Games (once you are in Pre-Season and have a schedule), COM Actions, Manage and Tools appear after the General Menu options. Under COM Actions you’ll find your typical day-to-day activity tools and lookups. This is where you’ll conduct your draft, assign awards and perform roster validations. Manage is more meant to be an area where you manage your league’s players, account, coaches, logos, teams, etc. This is also where the Settings sub-menu can be found. Tools are more functional pages like Advance Season, Game Deletion, Reset League and Save Points. GM options: all your options will appear after the General Menu options under the Team sub-menu. From here you will be find anything and everything for your team: Drafts, Finances, Media, Personnel, Rosters, Stats and Trade Central. UHS now uses the standardized timezones that are available in PHP. As a result of this change all timezones have been defaulted back to America/Los_Angeles. If you are in a different timezone, you will need to update it once you have logged in. One of the larger changes you’ll notice is the Draft page. For COMs this is found at COM Actions > Draft > Conduct Draft. For GMs this is found at Team > Draft > Entry Draft (yes, even for inaugural drafts). We’ve implemented some ajax into the page so once the draft is running it will automatically update every time a draft pick is selected. When it’s your pick you’ll be presented with selection options. The page will also show the last 10 selections. This is intentional to keep the data load small for each automatic refresh. If you need to see a full list of who was selected you can find that in Statistics > Drafts. The draft order for Season 2+ will now be automatically set based on the previous season. The Championship team will pick last. Playoff teams will then be ranked in order of their regular season standings. The remaining non-playoff teams will then also be ranked in order of their regular season standings with the worst team picking first. COMs can change the order afterwards if they so desire. Most folks will notice pretty much right away that their Personnel page no longer contains the list of possible actions for each player. This also applies to COMs’ manage team pages. You will now need to go view the player’s or coach’s profile in order to do an action with them (movements, contract offers, etc). The reason for this is pretty simple: We couldn’t fit all the necessary information on the screen due to responsiveness. 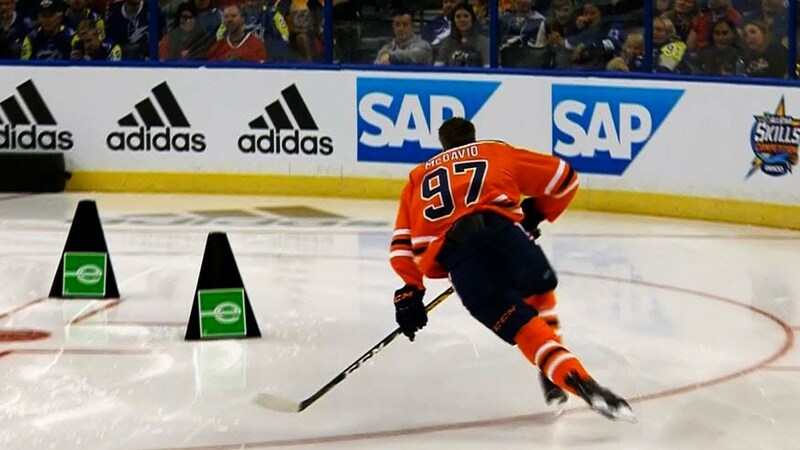 – The Accuracy shooting competition now has players shooting to hit 10 targets instead of 4. 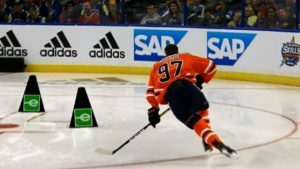 – The Hardest Slapshot competition now has a maximum of 110mph (previously it was 106). The NHL hardest shot record is 108.5, so we thought we’d like to go a little above that and see how things shook out. Lawyers are now an unlimited use option for GMs. Each time the GM uses the lawyer they will be charged the Appeal Fee regardless of whether it is successful or not. If an appeal is successful, the player’s suspension will be halved (rounded down). The team can make repeated attempts (and pay the fees) to completely clear out a player’s suspension. – Student: Fee increased to $100k (from $50k). – Assistant: Fee increased to $400k (from $100k). – Paralegals: They’ve all been fired! This option is gone! – Solicitor: Cost decreased to $9m (from $15m), Maintenance decreased to $2.25m (from $4m), Fee increased to $900k (from $250k). – Partner: Cost decreased to $16m (from $25m), Maintenance decreased to $4m (from $8m), Fee increased to $1.6m (from $500k). – Law Firm: Cost decreased to $25m (from $50m), Maintenance decreased to $6.25m (from $50m), Fee increased to $2.5m (from $1m). We’re bringing Medical in line with how Lawyers are set up, in fact, they use the same options by default, just with different names than their Lawyer counterparts. The biggest change you’ll notice here is that we’re no longer doing Medical Staff and Facilities as separate options. Instead you will pick your practitioner and use your Medical staff the same as you would your lawyer. Each time your medical check is successful, the player’s games missed due to injury is reduced by half (rounded down). All users’ timezones have been changed back to Pacific time as we are using a new method of timezone handling for user accounts. By default all accounts are created with America/Los_Angeles selected as their timezone. You can change this in your account page. Young players will now have a chance to grow. Players aged 16 to 20 will have a chance to increase their height at the end of a season when their skills rerate. At age 16, players will have a 50% chance to grow an inch (they also have a chance to grow 2 or even 3 inches). Players aged 17 to 20 will have a steadily decreasing chance to grow an inch. The UHS IM has been removed for various reasons. We could, in the future, implement a private messaging system, however, we need to tread carefully to ensure that we are GDPR compliant and determine how that impacts the rest of the site. – PubSites – Standings fixed columns (the team names) will no longer be fixed. This is an issue with dataTables. Once they fix the extra scrollbar problem, we will re-implement fixed columns on league standings. – Makeweight Creation – GMs are no longer able to create makeweights. If a GM needs a player they will be able to get a Makeweight (if desired) from the COM or Owner. – Marketing bonus revenue is now always double the revenue earned for that game. – Career Injuries are now a toggle instead of a variable number. When enabled there will be a 1 in 1000 chance that an injury will be ‘career ending’. By default this is enabled for all leagues. – The Mercy Effect has been removed from the game. Teams will play full tilt regardless of the goal differential. I may put this back in at a future date but it will be more of tweak to performance vs. a toggled setting. – Scouting settings have been moved into the Draft settings page. You will be able to Manage Scouting options in the manage menu (like Lawyers, Players, Coaches, etc). – AutoGMs will now be processed in the league’s Entry Draft Order instead of randomly. For Season 1 Off-Season the order will be swapped back and forth depending on the state of the league’s inaugural draft. Overall, AutoGM draft selections should happen much faster (1 round / minute). – Makeweight creation will now create Forwards instead of Centers or Wingers. – A bunch of reports have been moved from being COM only to the League > Reports sub-menu. – Teams now have most of their public data available in a League > Teams sub-menu that very closely mimics the version that is available through Public Sites. – Most tables that would need sortable columns now have dataTables implemented. If there is a table of information you would like to be able to sort, please let us know and we’ll see if we can use dataTables for it. – Users can now delete their own accounts. Released as hotfix on May 18 2018. – League Owners can now delete their leagues. Released as hotfix on May 18 2018. – Fixed an issue where Away Teams winning by Shoot-outs were not getting their SOW stat incremented correctly. Released as hotfix on Jun 6 2018. – Fixed an issue where some leagues could not have medal games (Bronze, Silver/Gold) created. Released as hotfix on Jun 23 2018. UHS Build 12529 - Does Copying Leagues Violate the GDPR?